H. Rick Bamman - hbamman@shawmedia.com DeKalb's Cole Tucker reacts after his first quarter touchdown against Prairie Ridge 54-35 Saturday, Nov. 19, 2016 in the IHSA Class 6A semi final playoff game in Crystal Lake. 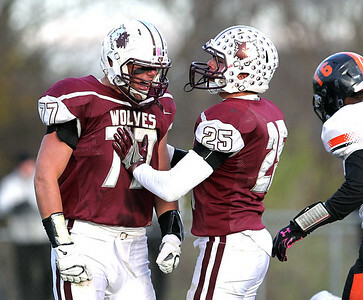 H. Rick Bamman - hbamman@shawmedia.com Prairie Ridge's Daniel Renteria, (from left) Justin Mikolajczewski and James Queen celebrate Mikolajczewski's interception in the first quarter. Prairie Ridge defeated DeKalb 54-35 Saturday, Nov. 19, 2016 in the IHSA Class 6A semi final playoff game in Crystal Lake. 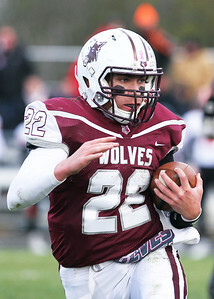 H. Rick Bamman - hbamman@shawmedia.com DeKalb's Cole Tucker runs 50 yards for a touchdown after catching a Derek Kyler pass as Prairie Ridge's James Queen gives chase in the first quarterSaturday, Nov. 19, 2016 in the IHSA Class 6A semi final playoff game in Crystal Lake. 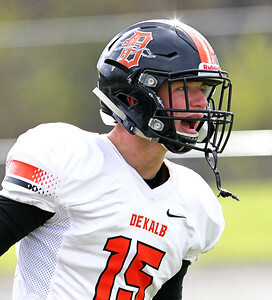 DeKalb was defeated, 54-35. 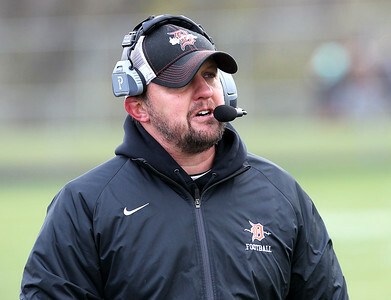 H. Rick Bamman - hbamman@shawmedia.com DeKalb's head coach Matt Weckler walks the sideline in the first half Saturday, Nov. 19, 2016 during the IHSA Class 6A semi final playoff game in Crystal Lake. 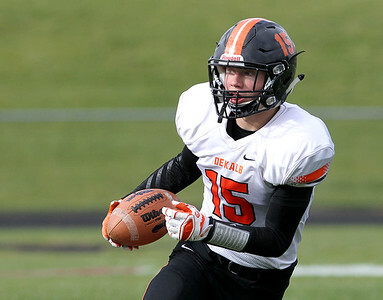 H. Rick Bamman - hbamman@shawmedia.com DeKalb's Cole Tucker runs in the first quarter against Prairie Ridge 54-35 Saturday, Nov. 19, 2016 in the IHSA Class 6A semi final playoff game in Crystal Lake. 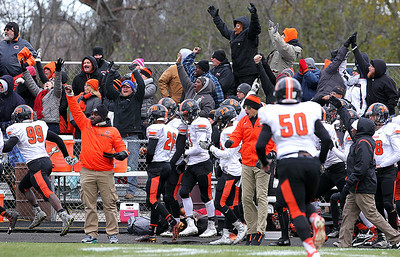 H. Rick Bamman - hbamman@shawmedia.com DeKalb players, coaches and fans react to the 80 yard pass play for a touch down in the second quarter Saturday, Nov. 19, 2016 in the IHSA Class 6A semi final playoff game in Crystal Lake. 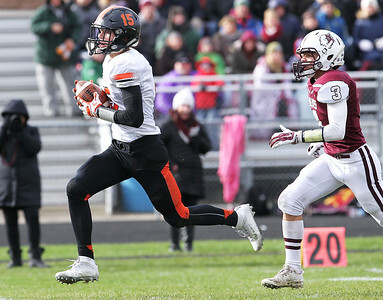 H. Rick Bamman - hbamman@shawmedia.com DeKalb's Zuerek Day catches a Derek Kyler pass for an 80 yard touchdown play as Prairie Ridge's Daniel Renteria gives chase in the second quarter Saturday, Nov. 19, 2016 in the IHSA Class 6A semi final playoff game in Crystal Lake. 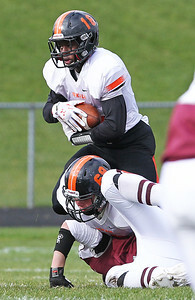 H. Rick Bamman - hbamman@shawmedia.com Prairie Ridge's Emmanuel Ebirim runs 26 yards for a first down in the second quarter as DeKalb's Jordan Gandy defends Saturday, Nov. 19, 2016 in the IHSA Class 6A semi final playoff game in Crystal Lake. H. Rick Bamman - hbamman@shawmedia.com Prairie Ridge's James Queen breaks up a pass intended for DeKalb's Cole Tucker in the second quarter Saturday, Nov. 19, 2016 in the IHSA Class 6A semi final playoff game in Crystal Lake. 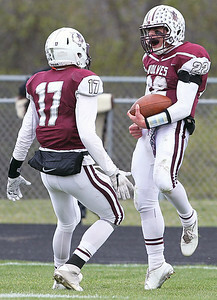 H. Rick Bamman - hbamman@shawmedia.com Prairie Ridge's Samson Evans (right) and Nicholas Hamilton celebrate Evans' 25 yard touchdown run in the second quarter Saturday, Nov. 19, 2016 in the IHSA Class 6A semi final playoff game in Crystal Lake. Prairie Ridge defeated DeKalb, 54-35. 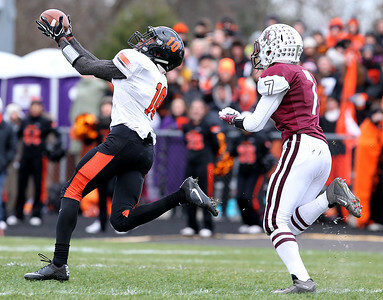 H. Rick Bamman - hbamman@shawmedia.com DeKalb's Zuerek Day gains six yards on the pass reception before being brought down by Prairie Ridge's Daniel Renteria in the third quarter Saturday, Nov. 19, 2016 in the IHSA Class 6A semi final playoff game in Crystal Lake. Prairie Ridge defeated DeKalb, 54-35. 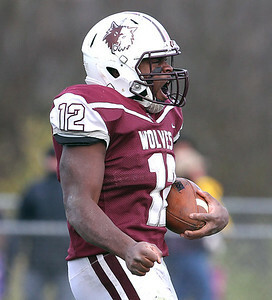 H. Rick Bamman - hbamman@shawmedia.com Prairie Ridge's Emmanuel Ebirim celebrates his seven yard touch down run in the third quarter Saturday, Nov. 19, 2016. 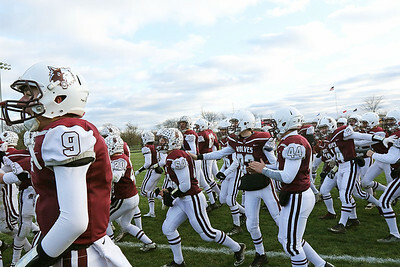 Prairie Ridge defeated DeKalb 54-35 in the IHSA Class 6A semi final playoff game in Crystal Lake. 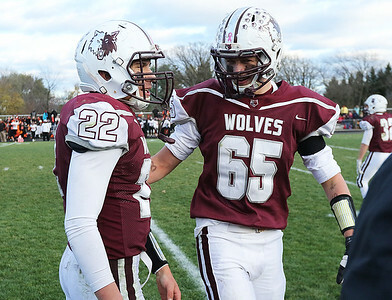 H. Rick Bamman - hbamman@shawmedia.com Prairie Ridge's Jeffery Jenkins and Jacob Ommen react after Jenkins' fourth quarter sack of Dekalb quarterback Derek Kyler Saturday, Nov. 19, 2016 in the IHSA Class 6A semi final playoff game in Crystal Lake. 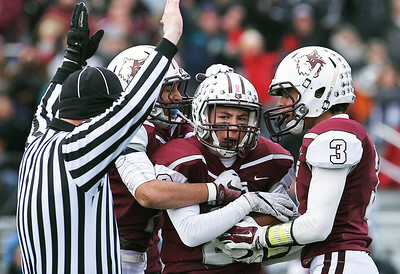 Prairie Ridge defeated DeKalb 54-35 to advance to the state title game. H. Rick Bamman - hbamman@shawmedia.com DeKalb cheerleaders react after a first down in the first half againet Prairie RidgeonSaturday, Nov. 19, 2016 in the IHSA Class 6A semi final playoff game in Crystal Lake. H. Rick Bamman - hbamman@shawmedia.com Prairie Ridge cheerleaders celebrate a touchdown Saturday, Nov. 19, 2016 in the IHSA Class 6A semi final playoff game in Crystal Lake. Prairie Ridge defeted DeKalb, 54-35. 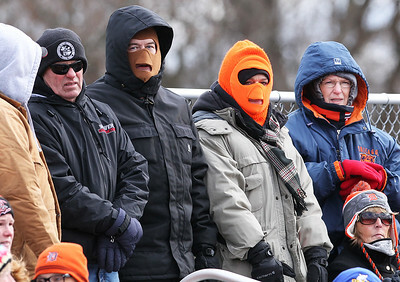 H. Rick Bamman - hbamman@shawmedia.com DeKalb fans watch the Barbs in the first quarter Saturday, Nov. 19, 2016 during the IHSA Class 6A semi final playoff game in Crystal Lake. 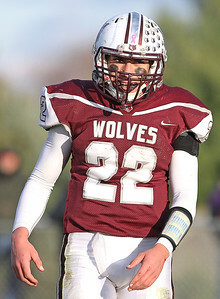 H. Rick Bamman - hbamman@shawmedia.com Prairie Ridge's Samson Evans taks the opening kick off on Saturday, Nov. 19, 2016 in the IHSA Class 6A semi final playoff game in Crystal Lake. Prairie Ridge won, 54-35. 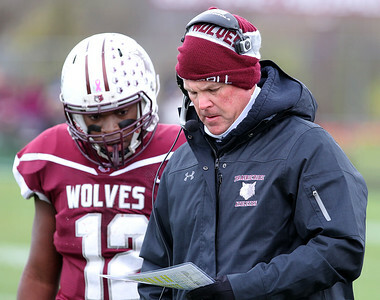 H. Rick Bamman - hbamman@shawmedia.com Prairie Ridge running back Emmanuel Ebirim and head coach Chris Schremp look over play selection Saturday, Nov. 19, 2016 in the second half of the IHSA Class 6A semi final playoff game in Crystal Lake. Prairie Ridge defeated DeKalb, 54-35. H. Rick Bamman - hbamman@shawmedia.com Prairie Ridge's Samson Evans (left) Peter Dunican react in the closing seconds of the fourth quarter during Prairie Ridge's 54-35 win over DeKalb Saturday, Nov. 19, 2016 in the IHSA Class 6A semi final playoff game in Crystal Lake. H. Rick Bamman - hbamman@shawmedia.com Prairie Ridge quarterback Sampson Evans looks to the sideline for the next play Saturday, Nov. 19, 2016 in the IHSA Class 6A semi final playoff game in Crystal Lake. Prairie Ridge defeated DeKalb 54-35 to advance to the state final. 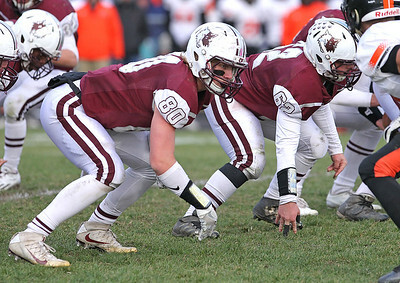 H. Rick Bamman - hbamman@shawmedia.com Prairie Ridge tightend Austen Ferbet (80) and offensive lineman Grant Golata (62) come off the line at the snap against DeKalb Saturday, Nov. 19, 2016 in the IHSA Class 6A semi final playoff game in Crystal Lake. 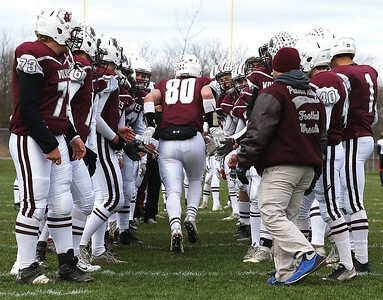 H. Rick Bamman - hbamman@shawmedia.com Prairie Ridge players cheer Austen Ferbet during introductions before the start of the IHSA Class 6A semi final playoff game Saturday, Nov. 19, 2016 against DeKalb in Crystal Lake. 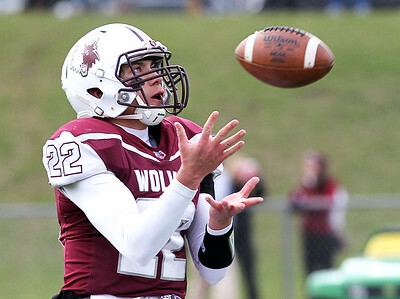 Prairie Ridge defeated DeKalb 54-35 and play Sacred Heart-Griffin Saturday. 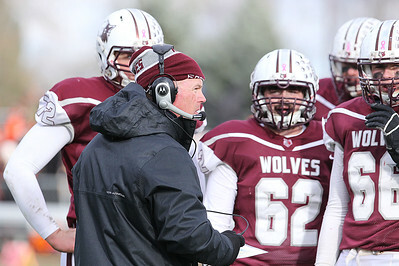 H. Rick Bamman - hbamman@shawmedia.com Prairie Ridge head coach Chris Schremp meets with his offense during a time out in the second quarter on Saturday, Nov. 19, 2016 in the IHSA Class 6A semi final playoff game in Crystal Lake. 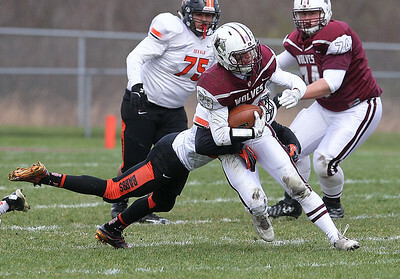 Prairie Ridge defeted DeKalb, 54-35. 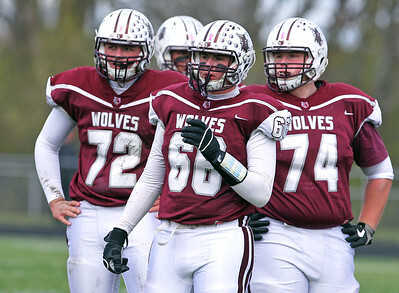 H. Rick Bamman - hbamman@shawmedia.com Prairie Ridge offensive linemen Garrett Crump (74), Justin Grapenthin (66), Grant Golata (62) and receiver Nicholas Hamilton come to the huddle in the second half Saturday, Nov. 19, 2016 in the IHSA Class 6A semi final playoff game in Crystal Lake. 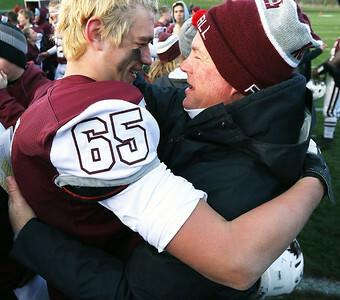 Prairie Ridge defeated DeKalb 54-35 to advance to the state final. 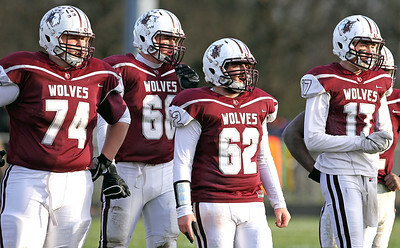 H. Rick Bamman - hbamman@shawmedia.com Prairie Ridge offensive linemen Benjamin Schultz (72), Justin Grapenthin (66) Garrett Crump (74) wait for the result of a penalty called on Saturday, Nov. 19, 2016 in the IHSA Class 6A semi final playoff game in Crystal Lake. H. Rick Bamman - hbamman@shawmedia.com Prairie Ridge defeated DeKalb 54-35 Saturday, Nov. 19, 2016 in the IHSA Class 6A semi final playoff game in Crystal Lake. 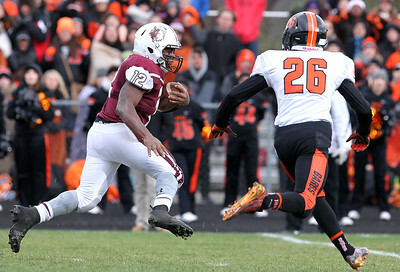 H. Rick Bamman - hbamman@shawmedia.com Prairie Ridge quarterback Sampson Evans runs for a first down in the second quarter on Saturday, Nov. 19, 2016 in the IHSA Class 6A semi final playoff game in Crystal Lake.